Reference number for this case: 3-oct-54-Billom. Thank you for including this reference number in any correspondence with me regarding this case. Cigars, saucers, flying cylinders, fly again in the four corners of France. Two saucers made an appearance in the sky of Clermont, the first, within ten kilometers of Clermont, moved in west-east direction. Witnesses stated that the machine approached within 150 meters of them while they felt a curious feeling and were "like frozen where they stood"... A strong nitrobenzene odor was perceptible. The other saucer was seen above the hills of Chanturgues, close to Clermont. It evolved vertically and was of a brilliant white. A saucer was also seen in Billom by a group of thirty people. The machine evolved above the city. It moved horizontally. It was visible during 3 or 4 minutes before disappearing. An intense light was produced by the apparatus. Note: the next part of the article can be read here. CLERMONT-FERRAND. -- Two saucers were seen yesterday in the sky of Clermont. The first within 10 kilometers of Beaumont, at 03:45 p.m., it moved in a west to east direction. The witnesses stated that the machine approached them and became less and less brilliant. When it was not any more than within 150 meters they felt a "weird feeling" and were like nailed on the spot. At this time an odor of nitro-benzene emerged. Soon the machine moved away, faintness ceased and the saucer disappeared. The other saucer was seen above the hills of Chanturgu close to Clermont. It moved vertically and was of a brilliant white color. A saucer was also seen in Billom by a group of 30 people. The machine moved above the city. It moved horizontally. It was visible during three or four minutes before disappearing. An intense light emerged from the apparatus. In St-Brieux several people saw a flying saucer which took the shape of a cigar before disappearing. They were able to observe it during more than one hour. The same phenomenon was noted in Trégueux where a cyclist returned home frightened by what he had seen. In Thouare-sur-Vie, (the Vendée) witnesses saw in the sky ten luminous objects having a lengthened shape and passing at a very high speed and high altitude. AND THE EYES LIKE "A CORBEL'S EGG"
Quimper. At about four o'clock on Tuesday morning Mr. Pierre Lucas, a baker at Loctudy (Finistere), who was busy getting water from the bakery yard, suddenly saw in the night a machine in the shape of a saucer of 2 m. 50 to 3 meters in diameter. He saw an individual measuring about 1 m. 20 who approached him and patted him on the shoulder, uttering unintelligible words. The baker's workman managed to keep his cool and went back to the bakery where the stranger followed him. In the light, Mr. Lucas was able to stare at the visitor: his face was oval, covered with hair, and eyes as large as a corbel's egg. The young man called his boss, but before the latter had the time to come down, the stranger had disappeared as well as his saucer, of which there no trace was found. A beer-dealer of Concarneau, for his part, declared that he saw in the sky two luminous disks of the form of round tables extended with a sort of tail. One of the discs was motionless while the other was maneuvering nearby. The two disks disappeared after ten minutes after launching a rocket. Mantua. -- The traffic was interrupted for more than one hour in the center of Mantova by groups of people gathered to observe a strange "white object" which moved, at a high altitude, clearly visible on the background of the blue sky. After performing extremely rapid maneuvers, the sphere-shaped apparatus - which, according to some witnesses, was part of a "flying saucer formation" - stood motionless in the sky for some time before it sisappeared on the horizon. On the other hand, the "Martians" seem to want to visit Italy too. Indeed, a fisherman from Roverbella, in the province of Mantua, said he was approached last night by a "mysterious individual", dressed in red, who reportedly told him "unintelligible words", and who reportedly quickly moved away before the fisher had the time to call his wife. Saint Brieuc. -- Several residents of Saint-Brieuc saw last night, a flying saucer that took the form of a cigar before disappearing. They were able to observe it for over an hour. The same phenomenon was observed in Trégueux where a cyclist returned home frightened by what he had seen. Two saucers were seen in the sky of Clermont. The first, 10 kilometers from Beaumont. It moved west to east. Witnesses said the craft moved closer to them and became less and less brilliant. When it was only 150 meters away, they felt a "curious sensation" and were nailed to the spot. At this timet there was an odor of nitro-benzine. Soon the craft moved away, the discomfort ceased and the saucer disappeared. The other saucer was seen above the hills of Chanturgues, near Clermont. It moved vertically and was of a brilliant white. A saucer was also spotted in Billom by a group of 30 people. The craft moved over the city. It moved horizontally. It was visible for three or four minutes before disappearing. An intense light emanated from the craft. The newspaper of Coulommiers "Le Pays Briard" publishes a letter sent by one of its readers, Mr. E. Farnier, member of the Society of Civil Engineers of France, about a flying saucer. In this letter Mr. Farnier stated that he saw above his property at Jouy-sur-Morin a large disc of 8 to 10 meters in diameter, rotating on the spot, with red-violet lights, making a whistling sound a bit similar to that of the arrival of a jet plane. The craft was about 400 meters high and hovered for more than 20 minutes above me", Mr. Farnier said, "so had all the time to check it out. The machine then disappeared in the direction of Coulommiers." "Former commissioner with the Aero-Club of France, having served in the aviation, I was not the victim of a hallucination and this machine was not a sounding-balloon, but a thick circular wing hovering on the spot and moving at very high speed gradually taking altitude." Paris, October 6 (A.F.P) - Several Parisians said they saw yesterday afternoon flying saucers moving in the sky of the capital, passersby claimed to have seen one around 4:30 p.m., near the Porte Dorée. Mr. Pierre Allouis, a cartoon trader, went to his business by taxi, when the vehicle was stopped by a red traffic light. Hearing, he said, a hissing whistling sound, he looked through the door and saw a flying machine flying high, leaving in its wake a plume of smoke. Mr. Allouis describes the saucer as a disc larger than a normal plane, silver-colored. The same testimony was given by Mr. Gilbert Bacon, residing at 25, Faubourg Saint-Antoine, and by Mr. Paul Julien, a painter, who lives at 3, rue de la Pompe. The latter, however, believes that it is not a flying saucer but a flying wing that has the shape of a triangle with rounded edges. At Le Bourget, it is explained that, given the intensity of air traffic, it is impossible to confirm by radar the passage of the craft at the insufficiently precise hour. On the other hand, the radar cannot record the passage of a heavier than the air more than by a luminous spot whatever the nature of the craft is. time. The first 10 kilometers from Beaumont at 3:45 p.m. It was moving in a westerly direction. Witnesses said the craft moved closer to them and became less and less brilliant. When it was only 150 meters away, they felt a curious sensation and were nailed to the spot. At this point there was an odor of nitro-benzine. Soon the craft moved away, the discomfort ceased and the saucer disappeared. The other saucer was seen above the coasts of Chanturges, near Clermont. It moved vertically and was of a brilliant white. A saucer was also spotted in Billom by a group of 30 people. The craft moved over the city. It moved horizontally. It was visible for three or four minutes before disappearing. An intense light emanated from the apparatus. Mr. Desbordes of St-Bonnet-de-Bellac said he had seen last Sunday a luminous disk heading for Mézières-sur-Issoire. The machine stopped for several minutes before disappearing to the west. Several people have observed the phenomenon. The magazine indicates that on October 3, 1954, in Billom, Puy-de-Dôme, more than 30 people witnessed an object in the South in the direction of Coppel, evolving horizontally and getting vertical to disappear. The two authors indicate that in Billom in the Puy-de-Dome, on October 3, 1954, at 07:45 p.m., about thirty people saw "an extremely shining machine, evolving during three to four minutes in the horizontal position then, after having put itself vertically, disappeared without leaving traces." They say the source is a newspaper article. Godelieve van Overmeire indicates that in 1954, on October 3 in France in Billom (Puy de Dôme), about thirty people see towards 19:45, an extremely shining machine, evolving during 3 to 4 minutes in the horizontal position, then, after having taken a vertical position, disappear without leaving any trace. The source is indicated as "M. FIGUET/ J.L. RUCHON: "Ovni, Premier dossier complet..." Alain Lefeuvre pub. 1979, p. 115." Luc Chastan indicates that in the Puy de Dômes in Billom on October 3, 1954 at 19:45 hours, about thirty people see "an extremely shining machine, evolving during three to four minutes in the horizontal position then, after taking a vertical position it disappears without leaving traces". Luc Chastan indicates as source "Ovni, Premier dossier complet... by Figuet M./ Ruchon J.L. ** Alain Lefeuvre pub. 1979". 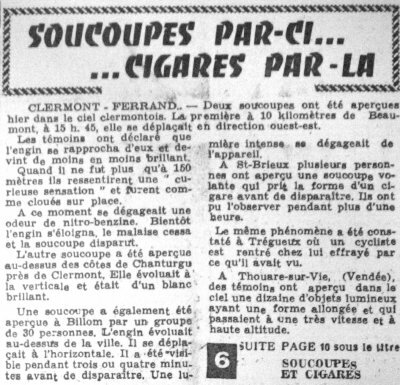 [lf1] Article in the national newspaper Le Figaro, Paris, France, October 7, 1954. 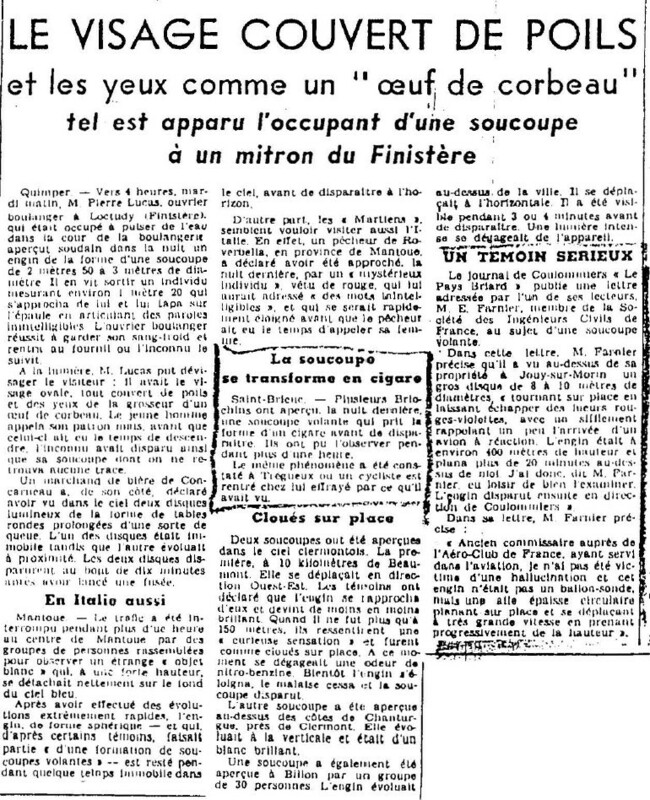 [lm1] Article in the regional newspaper Le Méridional, France, October 7, 1954. [hm1] Article in the regional newspaper Le Haut-Marnais Républicain, France, October 7, 1954. 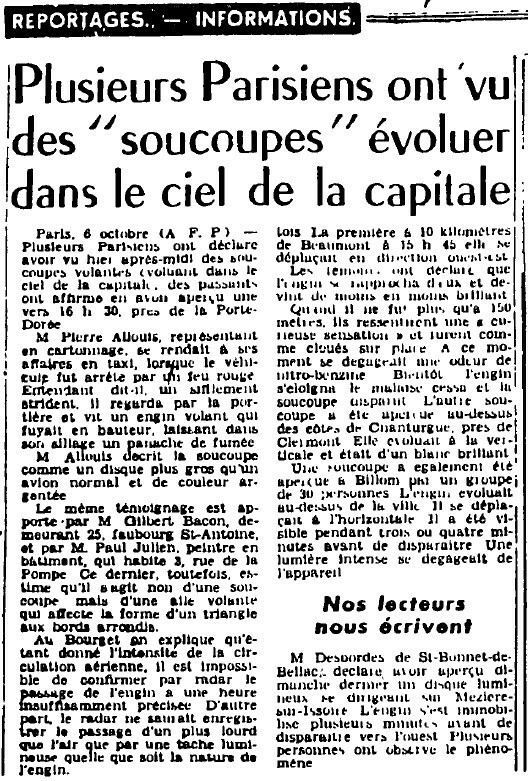 [pc1] Article in the regional newspaper Le Populaire du Centre, France, October 7, 1954. [ld1] "Les Archives de 1954 pour le Puy-de-Dôme", in the ufology magazine Lumières Dans la Nuit (LDLN), France, #125, page 26, May 1973. [fr1] "OVNI, Premier Dossier Complet des Rencontres Rapprochées en France", book by Michel Figuet and Jean Louis Ruchon, Alain Lefeuvre publisher, France, page 115, 1979. 0.1 Patrick Gross June 25, 2005 First published. 1.0 Patrick Gross January 9, 2009 Conversion from HTML to XHTML Strict. First formal version. Additions [go1], [lc1]. 1.1 Patrick Gross August 15, 2010 Addition [lm1]. 1.2 Patrick Gross January 9, 2017 Additions [hm1], [pc1], [ub1].